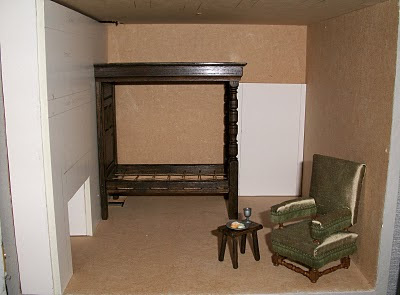 I'm afraid I have been neglecting The Tenement of late (I got carried away with another project) but at long last work has started on The Painted Chamber. 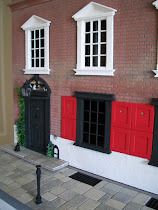 If you click this link: The Painted Chamber you'll see what I'm looking to recreate. Given the dimensions of the space I have available it will be a slighly condensed version and I've taken a bit of licence keeping the room the same as that shown in the picture despite the fact that the chimney stack is on the opposite side of the property. We'll just have to imagine a back flue somewhere! Oh Wow, Irene! That looks FANTASTIC! I can't wait to see what you make... your attention to detail is SURE to make it amazing! Will be very interested in how you decorate your walls Irene. Are you going to paint them? I adore the chair it looks deliciously comfortable. A real dozing chair. I'm looking forward to your interpretation of the painted room - your work is so admirable! The bed is a real rope bed! Lovely!! The furniture you already have is perfect for this room. I can't wait to see the fabric you have found for the bed. Your project is really fascinating. this looks amazing. I think the chair looks fantastic - well done on making it yourself! Excellent job. Can't wait to see the finished room.